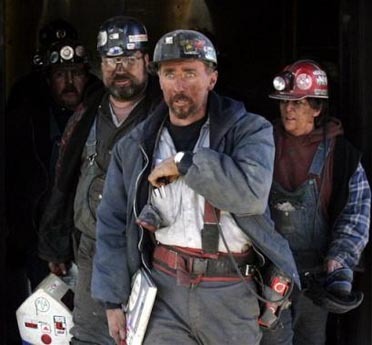 December 17, 2009 by Ken Ward Jr.
Coal miners exit the elevator leaving the North River No. 1 Mine some 700 feet underground after finishing their shift, Jan. 5, 2006 in Berry, Ala. Photo by AP. A new report from the U.S. Bureau of Labor Statistics paints a grim picture for the mining industry. The report lists “Support activities for mining” among the 10 industries expected to have the largest employment declines over the next decade. Employment in that sector (see here for definition, as it’s not just coal mining support activities) is projected to decline by nearly a quarter, from 328,000 to 252,000, by 2018. I noticed this report mentioned on The Huffington Post, which did a slide show about the numbers. Some of you may be interested to note that the “newspaper publishing” sector is also expected to take a bit hit, also with a projected jobs decline of about 25 percent between 2008 and 2018. The Department of Labor summary report does not go into detail about why mining support services is projected to be hit so hard. Certainly, folks in the industry will attribute this to the Obama administration’s “war on coal,” or to efforts to limit greenhouse emissions or more strictly regulate strip mining. But working miners — as well as political leaders who care about them — might want to consider other likely reasons. We’ve discussed the concept before here of “Peak Coal,” and the inevitable declined of the industry in the perhaps not-too-distant future. As I wrote in one post, Peak Coal might be coming to Appalachia sooner than you think. See other previous posts here, here, here, and here. Take the new Consensus Coal Production Forecast for West Virginia that was recently published by West Virginia University. It projects that Southern West Virginia steam coal production will fall by 60 percent between now and 2030. Mountaintop mining regulation and permitting issues continue to be a challenge for coal producers in the region. But it also offers other significant factors in this projected decline, such as the deteriorating regional labor productivity, marginal and costly steam coal reserves, increased use of scrubbers that eliminate the need for low-sulfur compliance coal, and potentially abundant supply and moderate prices for natural gas. Some experts see the possible deployment of carbon capture and sequestration as one way to try to blunt these projected production declines. But experts also tend to think CCS is not likely to be deployed widely unless some sort of limits on greenhouse emissions give utilities an economic incentive to act. But suppose that doesn’t work out … what’s the plan then for the economy in the Appalachian coalfields? These broad estimates are interesting, and presumably are done by disinterested people with lots of experience and expertise. And, could it be that some of the forces behind current posturing about the “war on coal” are more interested in spinning these sorts of predicted economic changes in a way that helps retain or increase political power– than they are interested in actually improving people’s economic futures? That is, could some of the cries about a “war on coal” really be more about politics — and not about policy? Could coal miners, and everyone else working in coal-related jobs, be seen (by some) not as people who need help, but as pawns in a political game? No, no one could be that cynical — or could they? The bigger story here is that the projected increase in total employment between 2008-2018 (15.3 million) is well short of what will be required to get those who lost jobs in this recent recession back to work (at least 7 million ), get the underemployed back to full employment( # ?) and absorb the projected growth in the civilian labor force (12.6 million). Stepping back from the mining piece, the trend is horrendous for anyone employed in an industry that actually produces a product according to this report. Service jobs increase while “good producing” industries continue to decline. Looking closer at the data (Table 2), of all the Goods-Producing industries mining employment increased annually at a higher rate (2.4%) than construction (1.6%) and manufacturing declined (-2.6%) in the last 10 years. Don’t be cynical–be worried! As for the prospects for all of us if CCS doesn’t pan out, if your concerned about climate, then be worried–without CCS there will not be a dent in CO2 reductions short of a permanent recession globally.